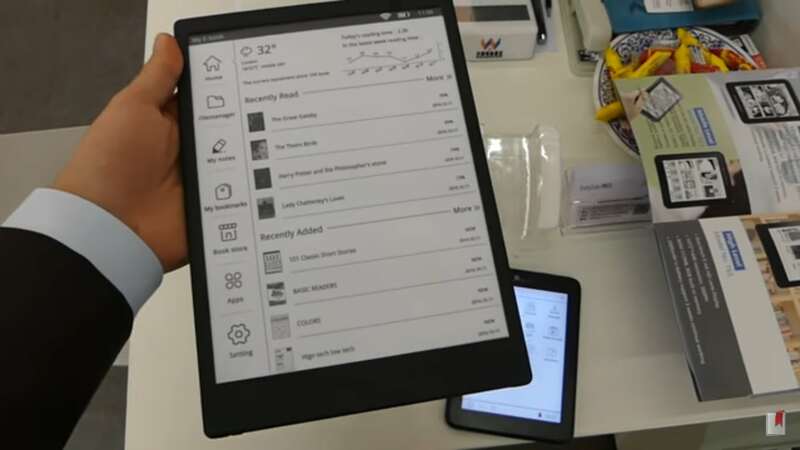 The Chinese ereader maker Boeye (or Boyue) is at the Frankfurt Book Fair this week, and Johannes Haupt of lesen.net went hands-on with their new and upcoming ereaders including one with a screen size we have never seen before. According to the video below, the Boeye T103 sports a 10.3" Mobius E-ink screen with a resolution of 1404 x 1872, or about 227.2 PPI. That is a sharper screen than any of the 9.7" or 13.3" screens on the market (although it pales in comparison to the Kobo Aura One). That would make the T103 highly appealing - if we knew when it will reach the market, and for how much. But at this point it is still in pre-production. and Johannes didn't say when that would change. Johannes also got a chance to look at a pre-production sample of the Boeye T65, a 6" ereader with a flush-mounted screen. As you can see in the video, it looks completely different from the T63, Boeye's flagship 6" ereader. The T63 has page turn buttons, while the T65 is a Kindle featureless black rectangle. I don't see the appeal, do you? Is the T103 a mock-up or an actual screen? The background of it looks very close to white with an amazing contrast compared the the other two readers in view. You were right. It is a mockup.